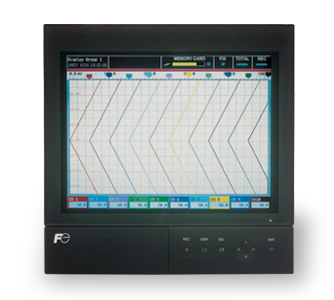 The compact PHU Paperless Recorder from Fuji Electric is an 9 / 18 / 27 / 36 channel recorder that displays data on a bright 12.0" TFT Color LCD. It offers a wide variety of display modes which allow users to view data in the form of Trends (Horizontal & Vertical), Bar Graphs, Analog Meters, Digital Display, Totalized Display, Event occurrence and more. Switching between modes is quick and easy with the 8-key front panel. An adjustable time screen function extends the life of the display and reduces power consumption. Users can record upto 12 types of thermocouples, 5 types of RTDs, and DC Voltage / Current input on one unit. The PHU Recorder can record years of data on a 1 GB Compact Flash Card. Saved data can be called back and played on the display screen. With Math function being a standard feature, the PHU can easily display results of desired formula using operands like addition, subtraction, multiplication, division, absolute value, x to the power of y, logarithm, natural logarithm, exponential function, humidity, average value, maximum & minimum values and more. Calculation functions like F Value calculation, Totalization & Square root extraction are also available as a standard feature. Moreover the user can also program upto 4 soft alarms per channel (provided as standard) and link them to an optional 10 point relay output card or a 16 point open collector output card. Additionally a 10-point digital input card can also be mounted. The digital inputs can be configured to Start/Stop recording function, Message setting, F Value calculation re-setting, Totalizing Start/Stop, Totalize re-set, LCD tuning etc. The PHU is equipped with an optional Ethernet (10Base-T) ports. Thus allowing for FTP transfer of files stored on the recorder's Compact Flash Card and live monitoring of all input and alarm status via HTTP. The PHU has in in-built Web Function whereby the user can display process values and event summary using Internet Explorer. The PHU also has an Email Function thru which it can send emails to a maximum of 8 addresses at upto 10 trigger timings thru a mail server on the connected LAN. The PHU also comes equipped with a PC based DataViewer software & Parameter Loader software along with USB configuration cable, waterproof gasket for the front fascia, noise filter for the power supply, instruction manual & panel mounting brackets.